The time for action is now and WCT invites you to be part of the solution. Through research and advocacy, WCT works to close the gender gap in Canadian information, communications, technology and media industries. In 2018, WCT release Closing the Gender Gap: A Blueprint for Women's Leadership in the Digital Economy, an extensive report exploring strategies which have been proven to help attarct, retain and advance women in ICTM. You can download the report by filling out the form on the right. More about Closing the Gender Gap report. With input from more than 250 leaders from across Canada, Closing the Gender Gap distills the known universe of strategies, policies and programs to attract, retain and advance women in digital industries in Canada. The report identifies the barriers to closing the gender gap and outlines clear recommendations for employers to improve their practices and leverage female talent more effectively. All topics of diversity in the workplace are discussed in the report, including quotas, pay-equity and sexual harassment. In 2018, WCT partnered with the Information Technology Association of Canada (ITAC) to host a series of events and workshops in Calgary and Edmonton to discuss and promote women in leadership in Alberta. Based on the conversations and feedback from the events, WCT and produced Where Are The Women in ICT in Alberta, which provides a clear picture of where women are in the industry as well as recommendations to improve their engagement and advancement. Up the Numbers is a sustained research and advocacy program lead by WCT, with the support and guidance of corporate members of its community, to report annually on where women are in the digital economy and to encourage measures to actively increase the participation of women in digital industries. Up the Numbers encourages digital employers to report their metrics on the engagement of women in various roles and at various levels in their organizations. The Up the Numbers initiative also includes WCT working with companies, governments and academic institutions to establish best practices and strategies to recruit and advance women in the digital economy. The goal of the Up the Numbers program is to maintain a persistent focus on the under-representation of women in digital industries and to underscore the strategic importance of gender diversity to an industry predicated on innovation and effective governance. Companies in this sector face chronic shortages of skilled labour, yet continue to accept a four to one male to female ratio as an acceptable status quo. Up the Numbers aims quite simply to improve the numbers of women in all aspects of these industries, including in technical and executive roles, until parity is achieved. The companies supporting the Up the Numbers campaign are Pythian, Telus, Accenture, Rogers, Cogeco, Microsoft and the Information and Communications Technology Council. Where Are the Women In the ICT Industry? Last year’s report presented a flat-line depiction of women’s engagement in Canadian ICT, frozen between 29.5% and 27% between 2011 and 2016. The data for 2017, drawn from the Labour Force Survey, shows very little change in this static picture. In 2017, the overall engagement of women in Canada’s ICT industry was 26.7%, down slightly from 2016 and significantly less than the 29.5% level recorded in 2011. 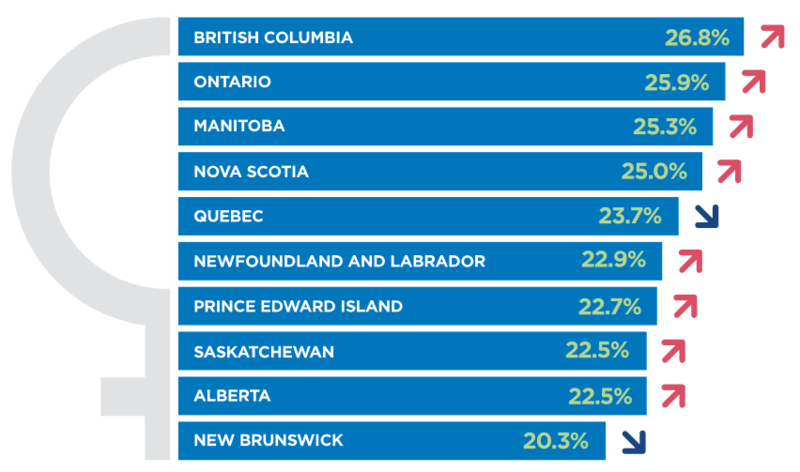 The full report breaks down the engagement of women in Canada's digital economy by province, sector, and management level. The conclusion? It's time to #UpTheNumbers. English translation unavailable for Up the Numbers Report. Digital Economy Leaders and WCT Commit to "Up the Numbers"